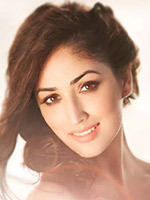 Yami Gautam born on 28 November 1988 is an Indian film actress and model who predominantly appears in Hindi and Telugu films. Yami was born in a Himachali family in Bilaspur, Himachal Pradesh and was brought up in Chandigarh. Her father Mukesh Gautam is a Punjabi film director. Her mother is Anjali Gautam. Yami has a sister Surilie Gautam, who made her big screen debut with the Punjabi film Power Cut. She did her regular schooling, and later entered college to pursue a graduate degree in law honours. She made her television debut with Chand Ke Paar Chalo, which was followed by Raajkumar Aaryyan. Following this, she played her most notable role in Yeh Pyar Na Hoga Kam, which aired on Colors. Yami made her film debut in the Kannada film Ullasa Utsaha. Though the film failed at the box office, Yami received positive reviews for her performance. In 2012, Yami made her Bollywood debut with the film Vicky Donor. Upon release, the film was a critical and commercial success, and Yami gained positive reviews for her performance.